Individualized P.T. program includes neurological, orthopedic, rheumatological conditions in conjunctions with pain management to ensure quickest, safest recovery time. Our team of therapists works with the resident as well as their family members to put a plan in place to help achieve the goals put in place. Whether that is to recover from an injury from a fall, or to just to regain strength and mobility, our team is here to encourage you or your loved one through the process. Brittany Essenpreis is our staff PTA who will work with our residents on their PT goals and plans. Brittany graduated from Kaskaskia College in 2014 and brings over 9 years of experience in Geriatric Care. 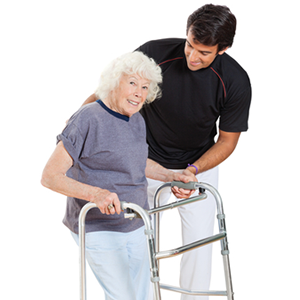 She has additional experience working with Orthopedic and Dementia Rehab patients as well.